-Wash and chop all veggies,keep aside. -Layer first starting with spinach in the dish,followed by mushrooms & then bell peppers . -In another bowl,beat the eggs,add salt,pepper powder & milk. 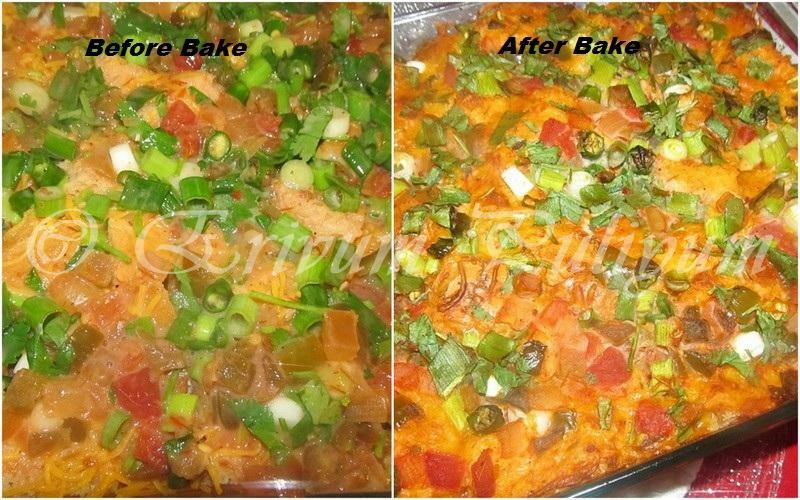 -Add cilantro,green onion chopped ,green chillies,salsa to the egg mixture. -Pour this over the shredded cheese in such a way that it reaches all sides and seeps through the bread soaking it fully. -Place in the pre heated oven and bake uncovered for 45 minutes. -Remove from oven,you will notice the egg is set,the cheese melts,bread is crisp on top & outer edges and soft inside.Cool it down for 5 minutes. 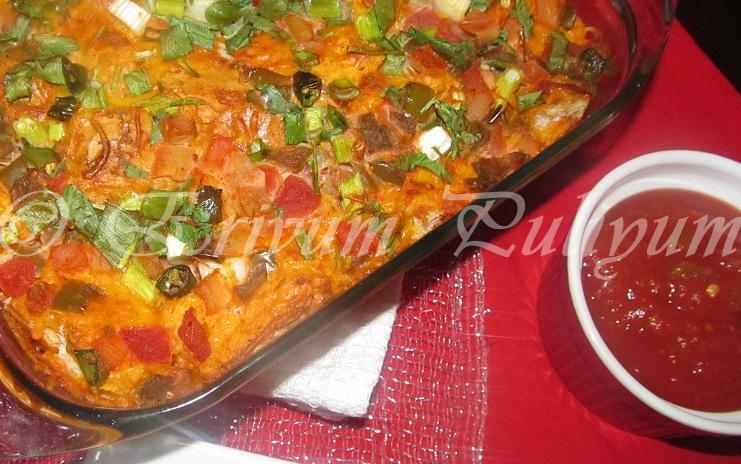 -Serve with salsa or pickles !! * I wasn't having spinach in my pantry,so haven't used spinach,instead increased the green onions stalks. * Use the green chillies and pepper powder as per your spice likes. very yummy recipe and easy too. Very healthy and delicious one pot meal. Casserole looks fantastic!!! Have to try eggless version. wow... this looks delicious... a must try!! 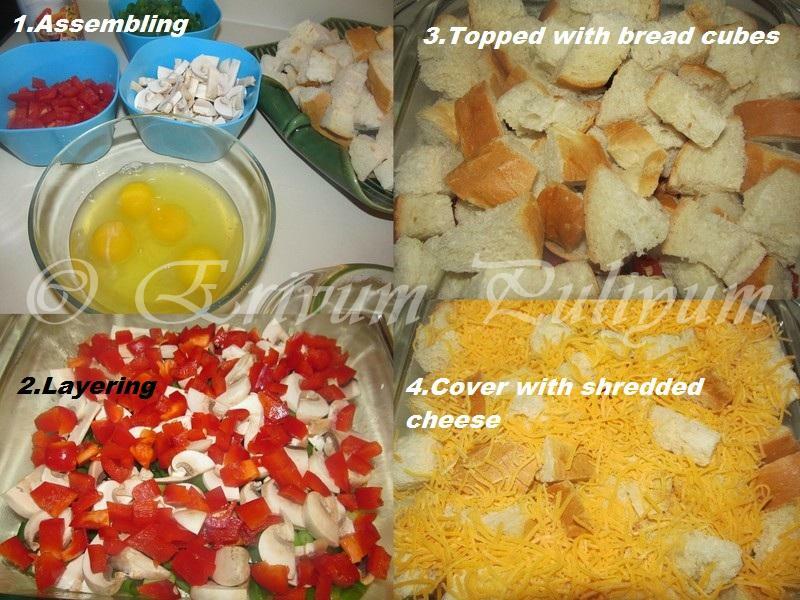 Lovely n healthy one pot meal..
wow this is so good julie, a great meal for breakfast/ dinner... and it fills you up too. Healthy n filling dish...love this! Love this recipe! Gonna try soon..
Ah the beauty of one-pot meal..so delicious and yet so practical..i would love to try this out. Yummy, healthy and filling too..
wow! thats easy, and yes, one pot meal. and hey Julie, i did try out your eggless, butterless beetroot cake. it turned out great...but was more towards the brownie texture, as i added whole wheat. 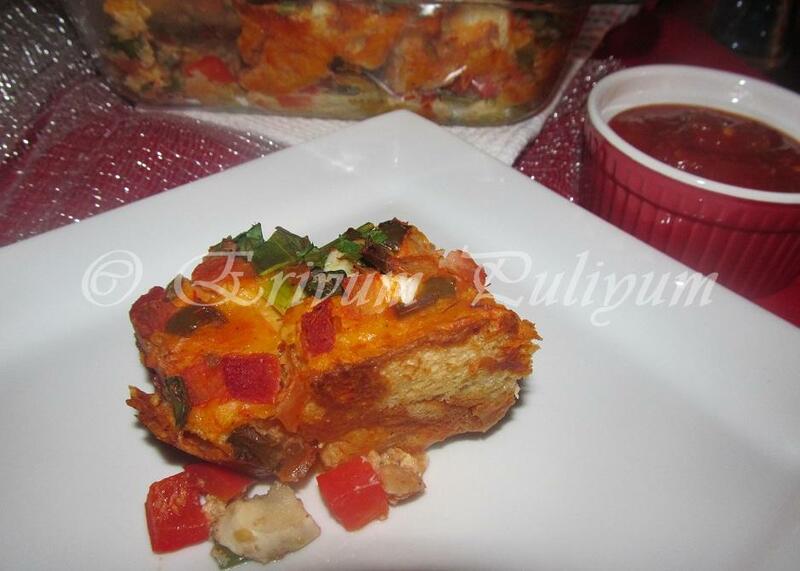 i will post it on my blog soon, and definitely will keep a link to yours for the recipe source. very delicious n filling one pot meak...looks so yumm!! This is a great recipe...easy and colourful! That looks like a perfect bake, Julia dear! Delicious and yummy one pot meal..
Fabulous one pot meal, love it! 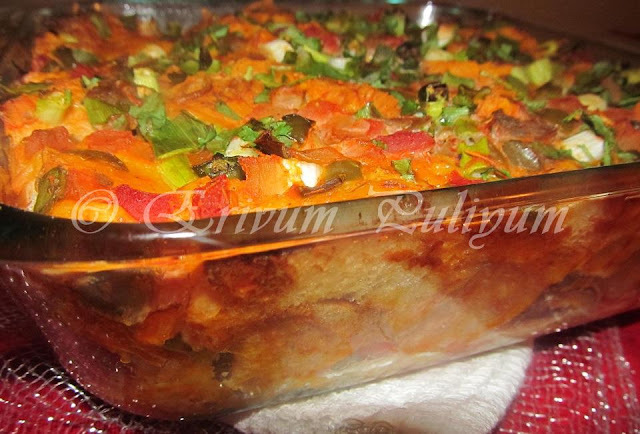 healthy recipe and looks scrumptious! nice clicks! Yum! Wish I can make it on Saturday as i need to go out on Sunday can you tell me a sub for eggs? now that is a perfect one pot dish.looks yumm.